Work is ongoing on a $1.4 billion project to widen State Route 91 from the Riverside County line in Corona to Pierce Street. 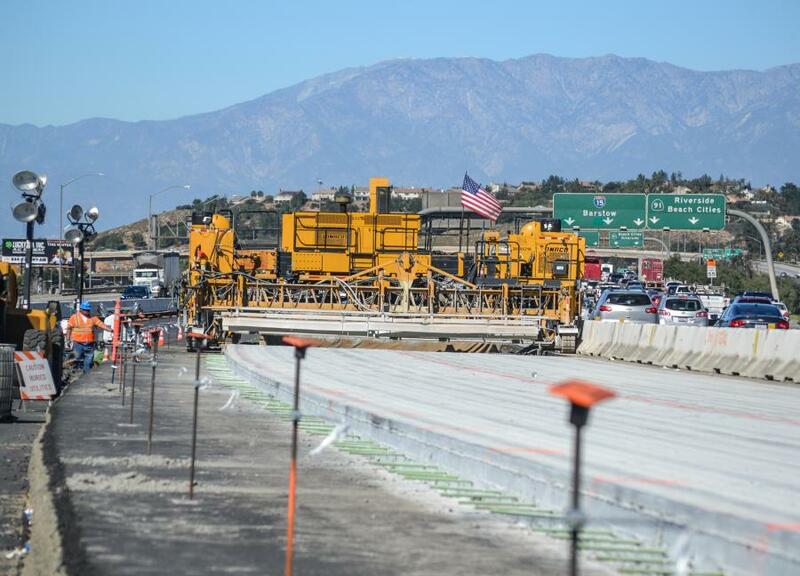 Work is ongoing on a $1.4 billion project to widen State Route 91 from the Riverside County line in Corona to Pierce Street just past Interstate 15 interchange in Riverside. The stretch of freeway from Anaheim to Riverside ranks as among the nation's worst commutes because of heavy traffic. Also, SR-91 is approaching 50 years old and the traffic demands now placed on it far exceed its original design from the early 1960s. Headed by the Riverside Transportation Commission, the project will add one regular lane and two express toll lanes in each direction, including the building of 11 new bridges, widening of 21 existing bridges, improving six interchanges, building 95 retaining walls and erecting 287,000 sq. ft. (26,663 sq m) of sound walls. 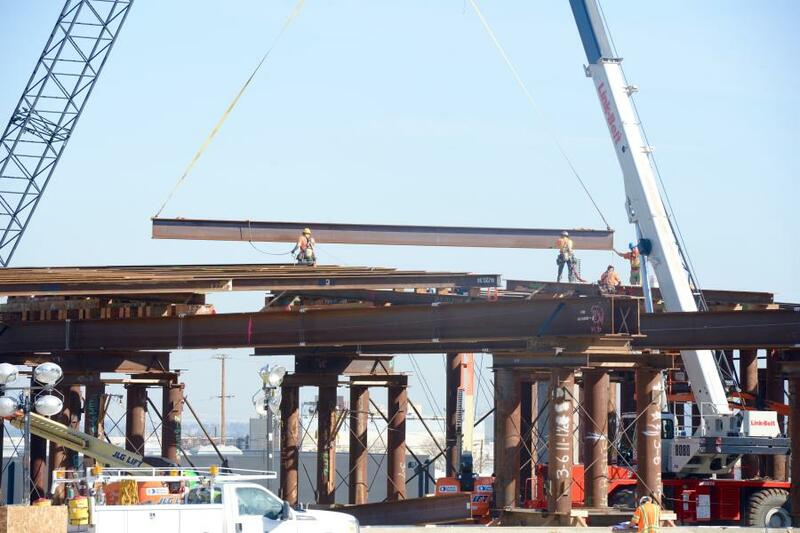 “The construction cost for the bridges is between $160 million and $175 million,” said Eliza Echevarria Perez, public affairs manager of the Riverside County Transportation Commission. With the additional lanes in place, commuters will face fewer traffic delays. And emergency responses to accidents and other problems should be faster. Work began in 2014 and is expected to be complete in 2017. 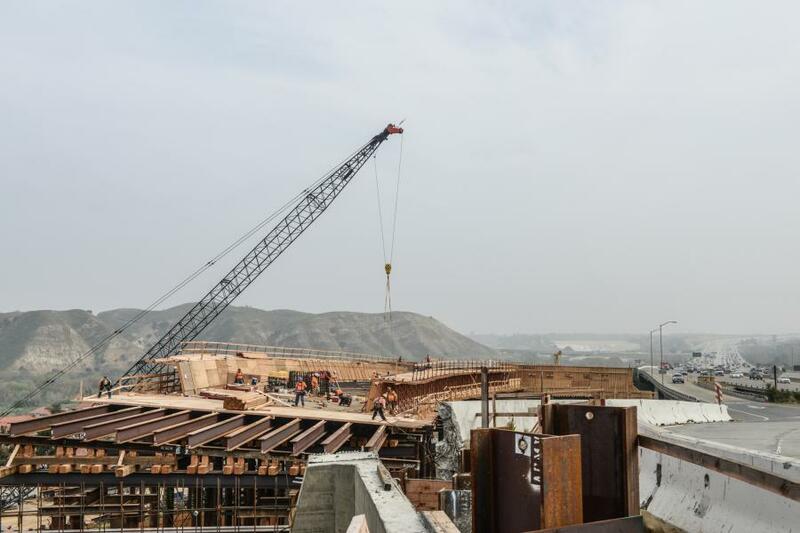 The project includes extensive use of pile driving, the common method of using large hydraulic hammers to construct foundations to support the bridges. Pile driving will typically be done on between 7 a.m. and 3 p.m. on weekdays, and pile driving activities will be listed in weekly construction alerts. Along with pile driving, current construction includes drainage and wet utility installations, retaining wall installation, bridge construction, concrete and asphalt paving, city street improvements and infrastructure installation for toll operations. The majority of road widening work to date has been on SR-91 between SR-71 and Smith Avenue and on the I-15 between Temescal Wash and Ontario Avenue. Heavy equipment needed to build and widen bridges includes excavators, drilling equipment, forklifts, cranes and bridge deck paving machines. Workers will apply 210,000 cu. yds. (160,556.5 cu ) of paving, add 90,000 linear ft. (27.4 m) of new drainage and relocate 92 full utility systems. Crews also will use large amounts of steel beams and lumber for the false work and formwork. Concrete and rebar will be used in the bridge structure. Funding for the project is provided by a combination of federal, state and local sources as well as toll revenue bonds. The express lanes will be fully funded by tolls from drivers who choose to use the lanes. Toll revenue will be used to repay the federal loan. The project is divided into 10 segments along SR-91 and south on Interstate 15. The segments make it easier to report what work is currently taking place. The Riverside County Transportation Commission purchased about 200 full or partial properties for project right-of-way needs. The commission awarded a $664 million design-build contract to Atkinson Walsh Construction Joint Venture of Foothill Ranch, Calif. The design-build approach was selected to save time in widening the much-used freeway. Between three and four years can be saved by having the same firm handle design and construction. “The joint venture was formed specifically for this project and is based at the project location in Corona, Calif.,” Perez said. She added that the majority of the bridge construction is being done by the design-builder. “They do have specialty subcontractors for specific elements of the bridge construction, primarily for the shoring, foundations piles and post tensioning,” Perez said. 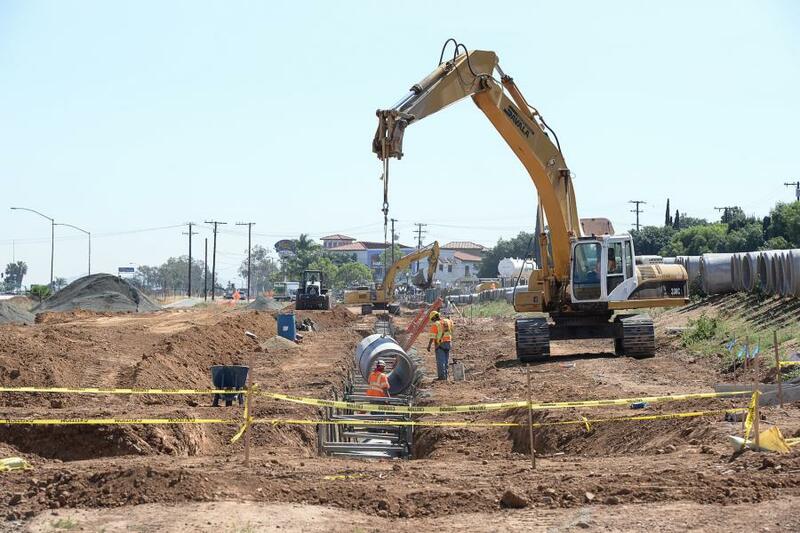 The project has about 35 subcontractors including All American Asphalt of San Fernando, Calif., for asphalt paving; Drill Tech Drilling and Shoring of Antioch, Calif., for foundation drilling and shoring; Tipco Engineering of Bellflower, Calif., for driven steel piles; Martinez Steel of Fontana, Calif., for reinforcing steel fabrication and installation; Select Electric of Norwalk, Calif., for electrical, communications and toll infrastructure; SSL LLC of Scotts Valley, Calif., for mechanically-stabilized earth walls; and EECOM of Los Angeles for design and engineering. A Project Aesthetics and Landscaping Master Plan (PALM) has been developed for the project that incorporates Corona's citrus industry heritage. It pays tribute to Corona's former title as lemon capital of the world. Design elements included a stand-alone art piece featuring a lemon and citrus blossom. It will be seen on walls and bridges throughout the project limits. 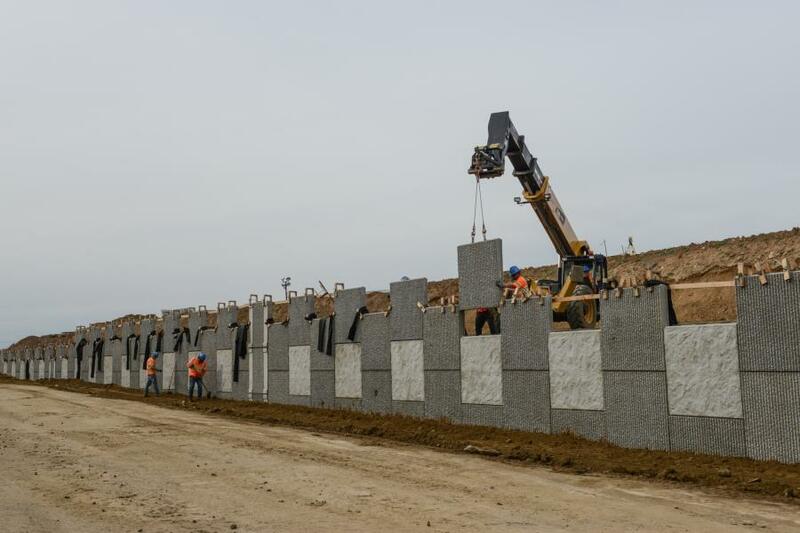 Walls will be constructed of split-face masonry block. Drought-tolerant trees, shrubs and vines will be planted to enhance the scenery, while conserving water. The project is expected to provide $220 million annually in direct spending to Riverside County. Analysts expect $545 million in indirect income for the county. Also, the SR-91 widening project is expected to create 16,200 new jobs including 4,600 related to project construction. In addition, commuters making a roundtrip on SR-91 will save about 12 minutes a day because of the added regular lanes and 78 minutes a day when using the new express toll lanes. About 280,000 vehicles travel the section of freeway each day. “A project of this size cannot be built without affecting the local community,” Perez said. In an effort to reduce the impact to commuters, lane reductions and ramp closures are conducted during nighttime and early morning hours. Several long-term closures of ramps are in place, including the westbound Main Street off-ramp, the eastbound Main Street onramp and the eastbound Serfas Club Drive onramp. Detours are in place to direct motorists to alternate ramps as needed and drivers will face periodic closures and detours, including night lane closures. The noise from equipment and pile driving will be loud at times. Demolition operations also will be noisy. Local streets will have to be realigned. Utilities will have to be relocated. 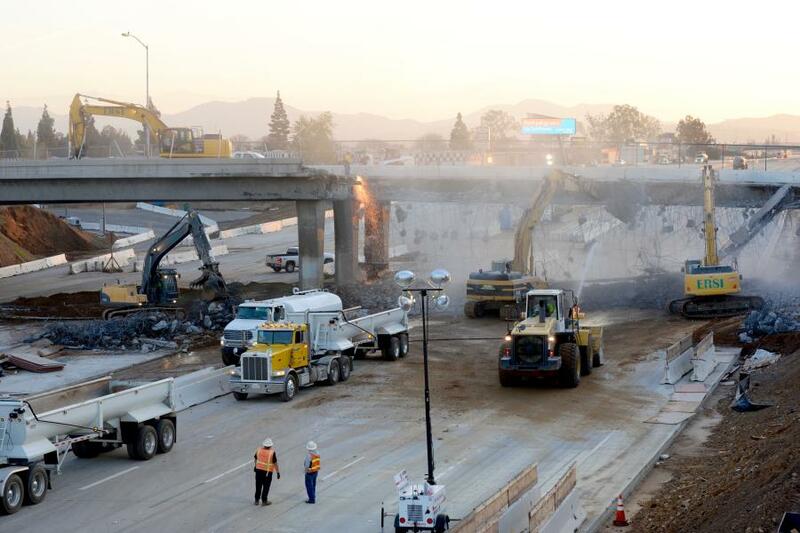 A recent “91 Steer-Clear” weekend full closure of the freeway segment presented a significant challenge to the project. It required informing and diverting motorists from the area, consolidating major work efforts by the design-builder and coordinating of multiple jurisdictions and emergency responders. 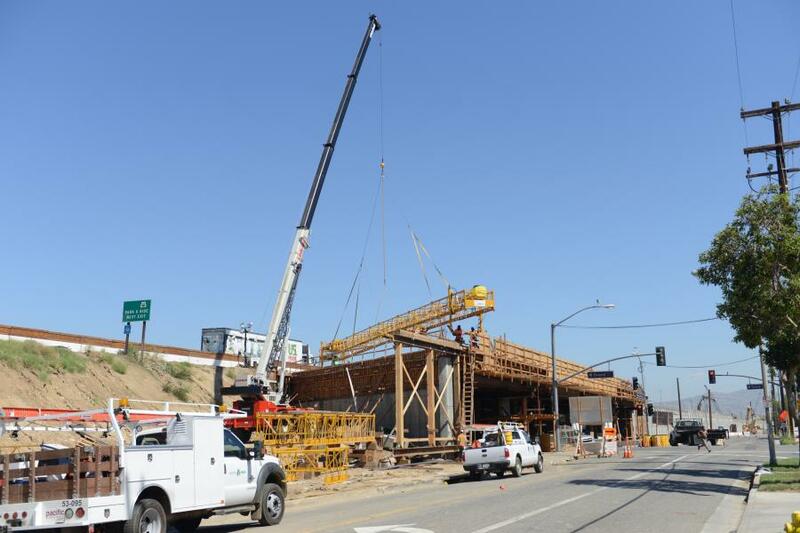 On another issue, workers have demolished and rebuilt a Corona, Calif., bridge that partially collapsed and injured nine workers in October. The 91 Freeway bridge spans E. Grand Boulevard. According to reports, the workers were lowering an on-ramp bridge into place when the jacking operation failed. That caused the bridge deck to drop about 16 in. (40.6 cm) and hit the wooden support beams. The beams then hit the workers. The cause of the accident is under investigation by Cal OSHA, Caltrans and KCE Structural of Washington D.C.
“The Riverside County Transportation Commission is awaiting the results of the report,” Perez said. Atkinson Walsh Construction Joint Venture decided to remove and rebuild the bridge to ensure the structure's long-term durability. During reconstruction, high-profile vehicles were not able to travel under the bridge. Atkinson Walsh reportedly paid for the new bridge.